Yesterday I delivered these eight paintings to Shooting Star Gallery in Suffolk, VA in preparation for a group show, "Food for Thought... ". This series has been my main focus for the past four weeks. The show opens on August 28th, and the reception will be held on Saturday, September 18, from 5:30 to 7:30pm. I will post more information about the individual paintings once the show opens. 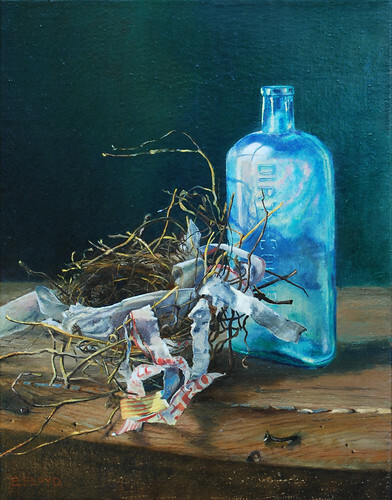 This week has been wonderful, getting this series completed, delivered to the gallery, and receiving the good news that my painting "Fresh Peaches" has been accepted into the Audubon Artists Annual Juried Show, which will be held in NYC at the Salmagundi Club Galleries on 5th Avenue in September. So this fall I will be in back to back shows in the big apple, this one and the Catharine Lorillard Wolfe Art Club Annual Open Exhibition in October. With all that is in the works, I am eager to start something new, and to pursue some new ideas that appeared last night when I was trying to go to sleep. I was so tired yesterday but unable to unwind and fall asleep... Does this ever happen to you? New ideas, concepts just start popping into your head and they seem so great that you are distracted and must stay awake alittle longer to think about them more. Well that was my night last night, hopefully tonight I will fall directly asleep. Here is the entire painting of the detail I shared last week. I am planning on fiddling with it a little more, refining a few areas and to wait for a really sunny afternoon so I can really observe and capture the fascinating highlights that reflect the studio window. Today has been a luxury in that I have stayed home working on this painting and planning future ones. The weeks have been flying by since April as I am enrolled in three different figure/portrait painting classes and one online landscape class. I have been just trying to keep afloat with attending classes and completing the homework. Oh well, you never you’re your limits until you reach beyond them… For the summer term my schedule will not be so full! In the midst of all this I have also been sending in submissions to various juried exhibitions and competitions and this month three of my paintings have been accepted into two different shows. 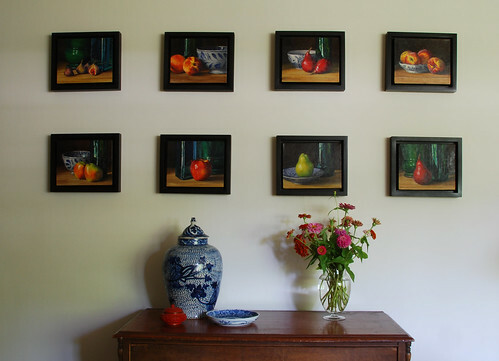 In June two of my paintings, Figs and Pomegranate on a Wooden Crate will be exhibited at the Rawls Museum Arts, and in July Three Apples on a Wooden Crate will be part of the Salmagundi Club Annual Non-Member Painting and Sculpture Exhibition in New York City. I am pretty excited about both shows as I have been entering a lot of them this year and have had on and off success. 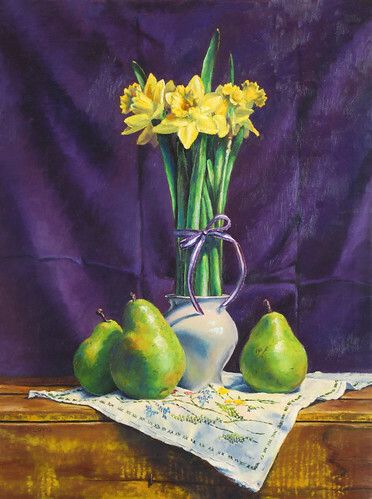 So my thoughts are to keep entering shows and make the most of all opportunities available, as you never know when a painting will capture the eye of a juror, the Three Apples painting has been turned down from other shows only be selected for the Salmagundi Club show. I will see you tomorrow to share some of the recent work from my figure painting class. This painting was completed last week; it is one of the three large paintings started in July. And yesterday it was selected into the Eighth Annual “Something Hot” Regional Juried Show held at Gallery 222 in Leesburg, VA. I am pleased it is included in the show and somewhat relieved. I had expectations of having to return to the gallery to fetch it because it did not make the cut. I always try to enter shows with this expectation so as not to be too disappointed and if I am fortunate to be selected to really feel a sense of pleasure and excitement for the inclusion. This painting has been an incubated idea for some time. I drew a charcoal sketch of it last year sometime and then this summer worked on other versions of composition before settling on this design. The goal was to really emphasize the quality of the hot space before and around the table and plastic chairs in contrast to the colonnade that is in deep shade. The sense that this may be a pleasant place to hang out in the evening, but during the mid-day it is totally oppressive from the heat of the sun.